Why is it that we can bring together a group of well educated, experienced and successful people and still not have a great, well-functioning board? ​The secret lies in the dynamics of the group. into the business of strategic leadership and scrutiny. ​We have put together an approach that accelerates the process of building an effective board team - a process that focuses on the quality and sustainability of boardroom conversations and relationships. Our Accelerated Board Performance Programme brings the whole board together over two days. First, it explores how the principles of good governance and effective board working apply in your Board and second it develops the Board as a well-functioning work group. 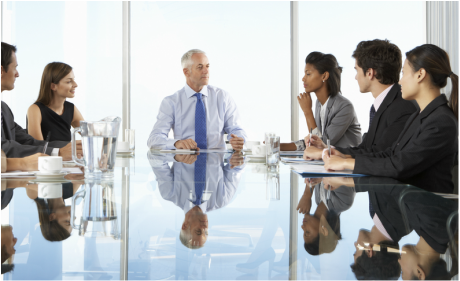 create focused, honest and powerful boardroom discourse. Investing in this Programme will signal to new board members the importance you place on the role of the Board. It will also encourage existing board members to reflect on their own contribution and how that might be developed and enhanced. It helps board members increase their flexibility, understand fellow board members better, and be more tolerant of difference. We provide personal feedback that increases board members’ awareness of their impact on their colleagues and on the quality of the board’s conversation. Even more valuable is the Board Team Report which predicts where boardroom discourse might be difficult and conflict might arise. From the Accelerated Board Performance Programme the new Board goes straight into its first board meeting. This means board members are able to apply their learning immediately and our experienced consultants are able to observe and give immediate feedback and make recommendations to the Board and the Chair.